A £1.1bn funding gap means the government's targets for broadband are unlikely to be met, says a report by the London School of Economics. The government wants 100% access to fast broadband services and 90% access to superfast services by 2015. The report says the government should do more to ensure that underinvestment does not harm the UK economy. 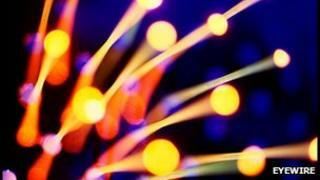 A rise in broadband penetration of 10% can lead to a 0.9%-1.5% boost in GDP per capita, the report adds. The cost of meeting the targets will be £2.4bn but funding for broadband from all public sources amounts to a total of £1.3bn, according to the LSE report, which was sponsored by customer management software company Convergys. That leaves an estimated £1.1bn gap that private investors will be expected to fill, it says. "The government target of 100% coverage by basic broadband by 2015 is likely to be met, but it is less clear when the government targets of 90% coverage by superfast broadband, and 100% coverage by fast broadband, are likely to be met," the report says. The LSE defines "basic" broadband as services offering speeds of up to 2Mbps. "Fast" broadband ranges from 2Mbps to 24Mbps, and "superfast" exceeds 24Mbps. Paolo Dini, one of the report's authors, said the government should spend more on broadband given the economic benefits it could bring. "In this year's budget the government allocated £200bn for transport infrastructure and £50m to broadband. That doesn't seem quite right." But a spokesman for the Department for Culture, Media and Sport denied the targets were likely to be missed. "We are confident of completing the roll-out by 2015. All local authorities except two met the government's timeline by submitting their initial broadband plans on time," he said. "We have always been clear this investment will not meet the full cost but will help make it economically viable for telecoms companies to roll out broadband to areas that would otherwise be left behind." Oliver Johnson, chief executive of Point Topic, a broadband research company, said the report's figures matched his own estimates for broadband spending: "There is definitely a funding gap. It's unlikely that the targets will be met." But he said that the UK was spending a significant amount on broadband compared with other European countries. "The UK is in the top two or three in terms of central spend and commitment to achieve comprehensive coverage. We are actually not doing too badly, although the whole of the western hemisphere lags behind Asia in this regard." The UK comes 17th in a global ranking of broadband penetration - the number of broadband lines per 100 population - according to Point Topic research. It says the UK's figure of 34.75% at the end of 2011 is behind neighbours including France, Belgium and The Netherlands, but just ahead of Germany, Canada and the US. But the UK ranks 31st in terms of the penetration of fibre-based services, a technology used to provide "superfast" services.